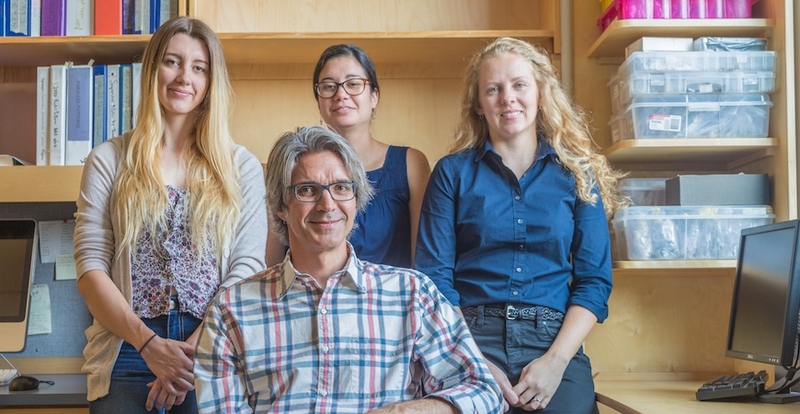 Professor Michael Dawson (seated) with graduate student Karly Higgins (left) and postdoctoral researchers Dannise Ruiz-Ramos (center) and Lauren Schiebelhut. The National Science Foundation recently awarded Professor Michael Dawson $900,000 to study some rather mysterious marine phenomena. Dawson received $700,000 — part of a three-year, $1.2 million grant awarded to Dawson and collaborators at UC Santa Cruz, the University of Georgia and Cornell University — to investigate the repercussions of the 2013 outbreak of sea star wasting disease (SSWD), a marine pandemic that killed 90 percent of ochre sea stars along North America’s Pacific coast. He received an additional $200,000 to collaborate with Professor Michael Beman to study the disappearance and enigmatic re-emergence of jellyfish in Palau’s Jellyfish Lake. A normal sea star (left) and a diseased sea star (right). Dawson’s lab began studying sea stars in 2012 with no particular interest in sea star disease. The SSWD outbreak changed that. “It turns the sea star from a hard candy into a marshmallow,” Dawson said of the disease. 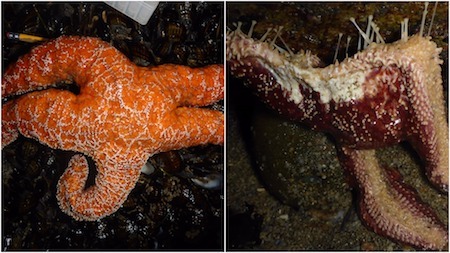 Afflicted sea stars develop surface lesions followed by arm loss. Tissue decay causes their normally rigid bodies to become soft and squishy. Eventually, the animals waste away. Although the pandemic killed 90 percent of Pacific coast ochre stars, Dawson’s team wanted to know if there was something special about the 10 percent that survived. Now they think genomics might hold the key. Lauren Schiebelhut was a graduate student in Dawson’s lab when she and John Wares, a collaborator at the University of Georgia, noticed an unusual gene variant overrepresented among ochre stars that were asymptomatic for the disease. It was a startling discovery. This variant is lethal if a sea star carries two copies (like humans, ochre stars have two copies of each gene, one from mom and one from dad). But carrying just one copy appears to impart some immunity against SSWD. Though Wares and Schiebelhut established a putative link between EF1A and SSWD resistance, nobody knows how it might render ochre stars resistant. Also unknown is whether other genes are involved. Now a postdoc, Schiebelhut will work with fellow postdoc Dannise Ruiz-Ramos to study the underlying mechanisms. They’ll use the newest genomic technologies to identify genes associated with SSWD survival and determine how these genes impart resistance. And with ochre stars experiencing the largest population resurgence ever recorded for the species, Schiebelhut and Ruiz-Ramos will compare survivors of the 2013 pandemic with the new arrivals to see if the younger cohort carry the genes that render them SSWD-resistant. 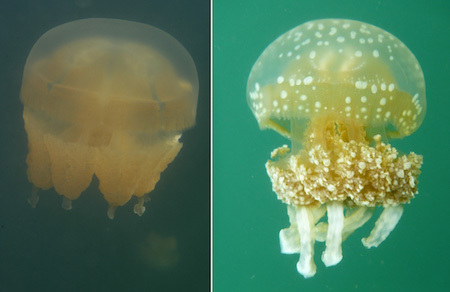 A typical golden jelly (left) next to the ocean-like jelly that appeared after the 2016 El Niño. Jellyfish Lake is a saltwater lake on the Micronesian island of Palau. As its name suggests, it’s teeming with jellyfish. Though the lake and surrounding ocean occasionally exchange water, their jellyfish are totally isolated: about 10,000 years of evolution separate lake jellies from ocean jellies. When an extreme 2016 El Niño event eradicated the golden jelly population, scientists were astonished by what happened next. Although the new lake jellies look like ocean jellies, researchers are certain they’re lake natives. Jellyfish have two distinct life stages. There’s the bell-shaped medusae that we’re all familiar with, and then there’s the polyp — a tiny, tentacled creature that attaches itself to the lake bottom, where it feeds and reproduces. Polyps can bud and give rise to more polyps, but they can also produce medusae. The 2016 El Niño eradicated the lake’s 5 million medusae. The polyps, however, survived. Then they started repopulating the lake with strange-looking jellies. Since these polyps are holdovers from the pre-El Niño days, they were also responsible for producing the lake’s famed golden jellies. But if that’s the case, what explains the sudden rise of medusae that resemble the ocean ancestors they separated from 10,000 years ago? This time, Dawson thinks he can find the answer, thanks again to recent advances in genetic technology. And he’s being joined by first-year graduate student Karly Higgins, who’ll help conduct the study. Higgins, who was recently awarded the prestigious Eugene Cota-Robles Fellowship, will study the genomes of Jellyfish Lake jellies to identify the underlying genetic causes of the observed shape-shifting. She’ll find out if the observed differences are attributable to environmentally-induced changes in gene expression, i.e, what genes are turned on and what genes are turned off.